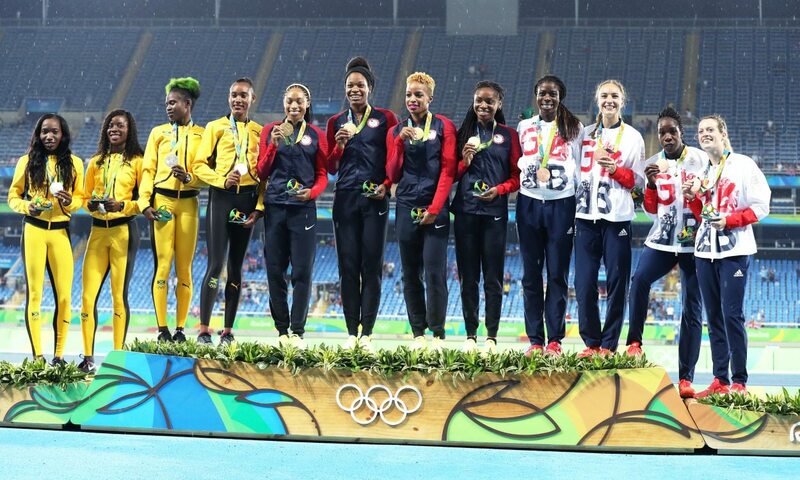 United States took their gold medal tally to 13 on the final night of track and field action at the Rio Olympics, helped by double success in the 4x400m relays. First an American quartet of Courtney Okolo, Natasha Hastings, Phyllis Francis and Allyson Felix combined to take the women’s title in 3:19.06 ahead of Jamaica with 3:20.34 and Great Britain’s 3:25.88, with Eilidh Doyle, Anyika Onuora, Emily Diamond and Christine Ohuruogu winning just the third ever medal for GB in this event at the Games. A short while later, Arman Hall, Tony McQuay, Gil Roberts and LaShawn Merritt took to the track and joined their female counterparts in securing success, running 2:57.30 to beat Jamaica’s 2:58.16 and Bahamas’ 2:58.49. For the US women, their victory saw the continuation of an unbeaten run in this event since 1996, while for Felix it was a record sixth Olympic gold medal, with her haul of nine medals overall matching the record tally set by Merlene Ottey between 1980 and 2000. “Track and field is such a big part of my life,” said Felix. “In track and field, there are always bumps in the road and each one of us had a unique journey to get here, but we pushed through. Great Britain had last claimed a medal in this event when Phylis Smith, Sandra Douglas, Jennifer Stoute and Sally Gunnell got bronze in Barcelona in 1992. “I have so much faith in these girls,” said 400m hurdles finalist Doyle. “As soon as I pass the baton over I think I can trust these girls to get the job done. So hopefully I set it up nicely and then it just looked incredible. Ohuruogu, competing in her sixth Olympic final, ran an anchor split of 50.6 to become the first British female track and field athlete to win a medal at three successive Olympics. “Today wasn’t really about me, I just wanted a team effort,” she said. “After yesterday we knew a medal was up for grabs but it’s all well and good saying it, we knew we’d need a strong performance to get it from all the girls. Spain’s Ruth Beitia enjoyed first-time clearances up to her winning height of 1.97m to win her first major high jump title at the age of 37 on countback ahead of Bulgaria’s Mirela Demireva and Croatia’s Blanka Vlasic. Beitia, who cleared her Spanish record of 2.02m in 2007, found 2.00m too much on this occasion but her victory was secured with Demireva having required two attempts at the opening height of 1.88m and Vlasic, who had been struggling with injury, needing two tries at each of her three heights. USA’s Chaunte Lowe also cleared the winning height but missed out on a medal on countback after needing three goes at that mark. Britain’s double world junior champion Morgan Lake, who had equalled her PB and UK under-20 record of 1.94m to make the final, cleared a best of 1.93m for 10th, while her fellow teenager Vashti Cunningham of USA, who won the world indoor title in March, placed 13th. Germany’s Thomas Röhler had gone into the javelin competition as favourite thanks to his PB of 91.28m in June and again throwing beyond 90 metres he got the gold, beating world champion Julius Yego of Kenya and defending champion Keshorn Walcott of Trinidad and Tobago. Launching the spear to 90.30m in the fifth round, Röhler had a final foul but it didn’t matter as he had victory secured as Yego threw 88.24m in the first round but struggled with injury. That was the Kenyan’s only legal throw as he fouled twice, passed once and then retired from the competition in the fifth round. Walcott claimed bronze with his best of 85.38m, a mark just six centimetres ahead of Germany’s Johannes Vetter in fourth.